While the rest of LA was designed to “drive-in,” Downtown Los Angeles is a “drive-in & drive-out” experience. In a famously decentralized Southern California, Downtown is a default metropolis. During the day, it plays the role of “city center” well. The urban “hustle and bustle” is properly represented. Taxi cabs, pedestrians, and congestion are plentiful. 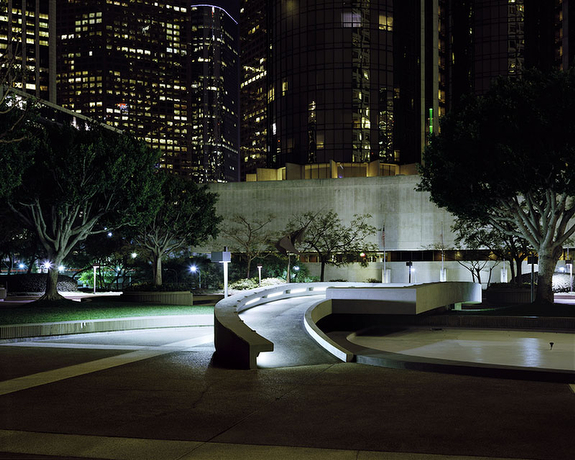 But at night, after the cast and crew drive home, downtown LA resembles an empty film set. The movie being filmed there was about a city of the future; a city with no past and no name, a postmodern “Emerald City” where our dystopian fears of the future have in some ways been realized. 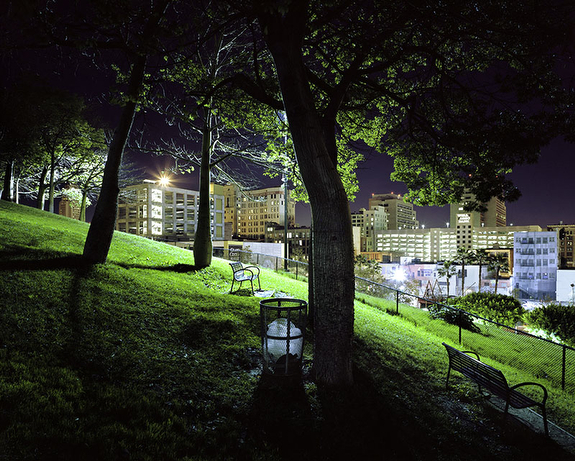 Downtown Oz was photographed in Downtown LA from 2009 to the present and is ongoing. A majority of the field work was done on foot from the perspective of a pedestrian, a “Dorothy-like” photographic exploration. Some of the photographs were taken at locations that have appeared in popular movies. Other photographs were taken while film crews are in live production, and the remaining images are seemingly quintessential cityscapes. My exploration of downtown Los Angeles finds a city where the boundaries of representation and reality are in a state of constant flux, a city whose own simulacrum references itself.